Lupinus (lew-pye-nus) Lupine; Fabaceae Family. The lupines are a large genus comprising between 200 and 600 species, native to North and South America and the Mediterranean region. There are annuals, perennials, and so-called tree lupines. All are hardy and have colorful spikes of bloom, although differing in growth habit. They can be grown from seeds, though germination is slow. Perennial lupines may be propagated by division of the clumps in early spring, but this must be done with care because of their reluctance to be moved. They will grow almost anywhere in well-drained soil and sun. Lupinus perennis is on the preservation list of some states. Lupines really come into their own during warm, sunny days and cool nights and look especially lovely when grown in masses with similar varieties. A memorable sight for any garden lover, these beautiful plants grow into well-established clumps, with several stems rising up out of a single base. Like most members of their family, lupins can transform nitrogen from the atmosphere into ammonia via a rhizobium-root nodule symbiosis, fertilizing the soil for other plants, this adaption allows lupins to be tolerant of infertile soils and capable of pioneering change in barren and poor quality soils. Lupines peak with warm, sunny days and cool nights. Well-established clumps will send 10 to 12 flowering stems up out of a single clump. Lupines require moderately fertile, slightly acidic, evenly moist, well-drained soil. Lupines find it difficult to survive in areas with extremely hot summers. Applying mulch around the root zone will help to keep the roots cool and will protect them over the winter. Deadheading spent flowers will prolong the bloom time, as well as rejuvenate the plants. 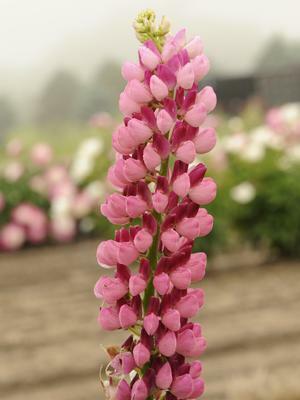 Hybrid lupines may be grown from seed, but will not come true from seed in the garden. Propagate from sideshoot cuttings in late spring to early summer. Prune plants close to the ground if powdery mildew or aphids become a problem. Attributes: Border plants, Cut flower, Fragrant flowers, Mass Planting, Salt Tolerant. Attracts butterflies and hummingbirds. PLANTING: Set plants 15 to 18 inches apart. Choose a location in full sun or, especially where the summers are very hot, light shade, and where the soil is well-drained but not too fertile. Lupines are best when planted in groups. MAINTENANCE: Water during periods of drought. In the southern-most zones, we recommend summer mulch. Remove spent flowers before they set seed. Cutting back flowering stems after blooming will also encourage a second bloom.